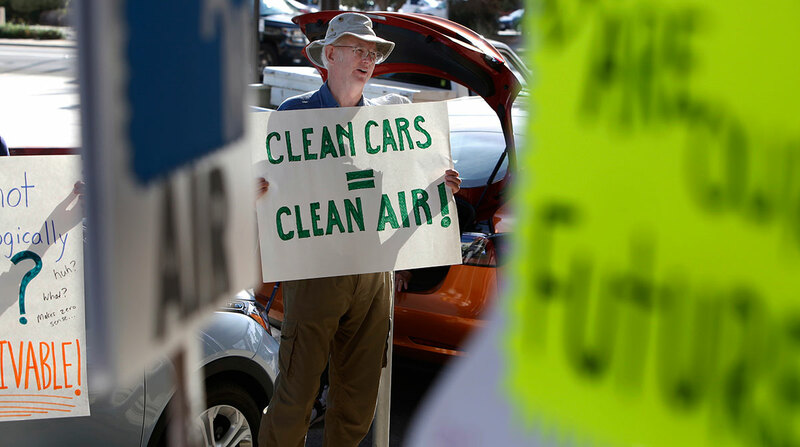 FRESNO, Calif. — The Trump administration’s proposal to roll back national fuel-economy standards was headed for its second public hearing a day after California officials and scores of speakers blasted it as a danger to the environment and public health. The second hearing was scheduled for Sept. 25 in Dearborn, Mich. — a city in a region dominated by the auto industry where it could get a better reception. A major auto industry trade group says it supports annual increases in fuel efficiency, but it also says customers aren’t buying more efficient cars. Under the deal finalized under Obama, the standard would rise to 36 mpg by 2025, 10 mpg higher than the current requirement. The goal was to reduce car emissions and save people money at the pump. Trump administration officials say waiving the tougher fuel-efficiency requirements would make vehicles more affordable, which would get safer cars into consumers’ hands more quickly. At the Sept. 24 hearing, California officials said the proposed rollback would damage people’s health and exacerbate climate change, and they demanded the Trump administration back off. Looming over the administration’s proposal is the possibility that California, which has become a key leader on climate change as Trump has moved to dismantle Obama-era environmental rules, could set its own separate fuel standard that could roil the auto industry. That’s a change the federal government is trying to block. “California will take whatever actions are needed to protect our people and follow the law,” California Air Resources Board Chairwoman Mary Nichols testified at the hearing with federal officials in a region of central California that has some of the nation’s worst air pollution. Automakers are unanimous in favoring one standard for the country so they don’t have to design two vehicles, one for California and the states that follow its requirements and another for the rest of the nation. The hearing was held in California’s San Joaquin Valley, the country’s most productive agricultural region but an area plagued by sooty air in part because of its bowl-shaped geography. The Sierra Nevada and two other mountain ranges wall in the 250-mile valley. Air pollution there is blamed for hundreds of deaths each year. Another hearing is planned for Sept. 26 in Pittsburgh. Tom Krisher contributed this report from Detroit.